I made these light and fluffy soft buttermilk pancakes a few times. My big kids loved them very much and commented "they tasted like McD hotcakes :D". 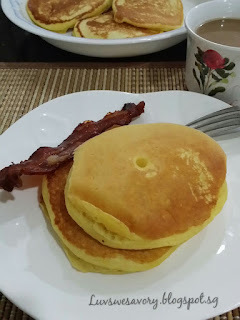 I've added some mashed pumpkin to the batter ... so we have another variation of pancakes .... Pumpkin Buttermilk Pancakes for our weekend brekkie ^-^! Below my slightly modified version with added mashed pumpkin. 1) Lightly whisk and combine the dry ingredients (A) in a large bowl, and make a well in centre of mixture. 2) In another smaller bowl, whisk ingredients (B) till combined and pour to (A) and whisk with a manual whisk until smooth. 3) Heat the non-stick griddle or pan with low flame. Dap some cooking oil with kitchen towel and lightly grease onto the non-stick griddle or pan. 4) Spoon batter of your desired size into the pan (big spoon, ladle or ice-cream scoop). Flip gently with a spatula when tops are covered with bubbles and edges look cooked. Cook for another 1 - 2 minutes or till golden brown on both sides. Serve with drizzled maple syrup over the warm pancakes. Top with your preferred berries/fruits or savoury ham/bacon. Yummy ! 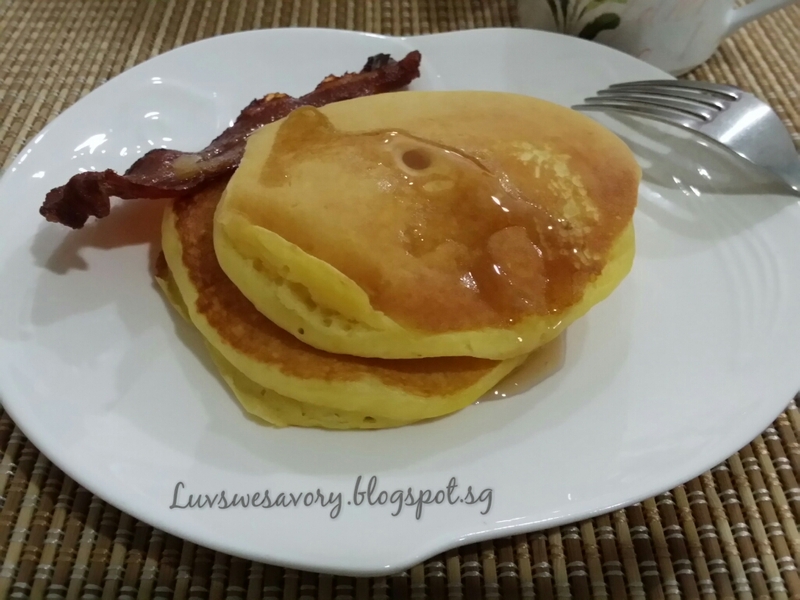 Enjoy ... simply ♡ these fluffy soft pancakes! This is just perfect for a healthy and yummy breakfast! I like this pancakes serve with drizzled maple syrup. Hi Karen, these would be a big hit in my house too, we all love pumpkin. Karen, I would love to have some of your pumpkin pancakes. I love pumpkin. Oh my, those pancakes come straight out of heaven. Yummy looking pancakes! Soft and fluffy! Now, is that a piece of sinfully yummy bacon? I like! Hee .. hee... yea just 1 small piece of sinfully yummy bacon ^-^! These pancakes look so moist and fluffy! I'm sure pumpkin is the magic ingredient in this recipe!!! Hi Karen, I have this recipe but when I saw buttermilk, just didn't want to make them. I believe this is good pancake. Any idea if what we can use to replace the butter milk with? For some of my muffins & pancakes, I've ever used milk and increased slightly on baking powder but the texture is not so fluffy vs using of buttermilk. Karen, your pancakes look so yummy! I can see that they are fluffy good. And oh, I spotted a piece of bacon hee..hee..
Hee hee ... You're right Phong Hong, just 1 small piece of savoury bacon with my maple syrup fluffy pancakes yummy! Hi Karen, your pancake looked so soft and fluffy! 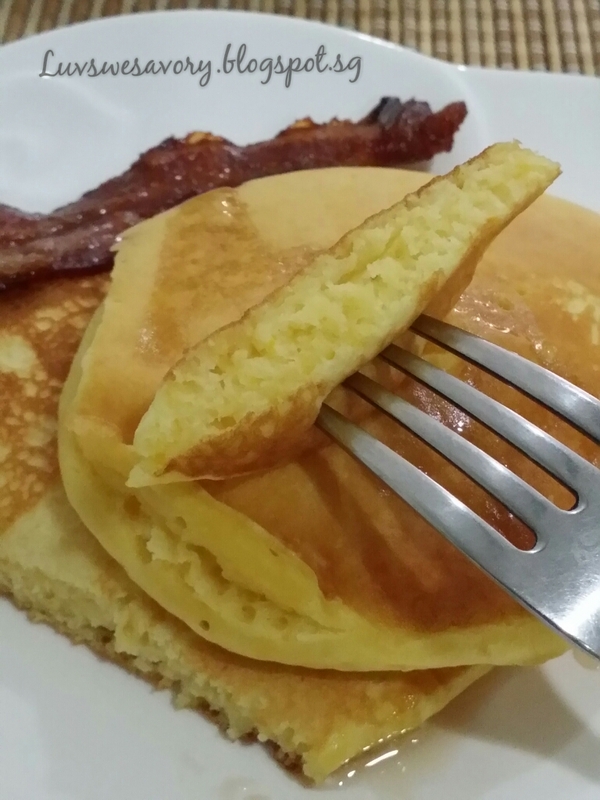 Pancake is my family 'must-have' breakfast on weekend. But ususally I make the plain one bcos my children prefer to eat it with jam and sausages. Hi Amy, thanks. I usually make the plain ones too ... they have asked lesser of McD hotcakes now since we could replicate something similar at home.